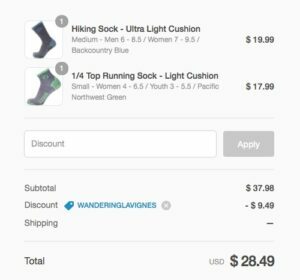 Justin and Patrice did not discover CloudLine hiking socks until 2016. The Seattle-based company is young and their socks are manufactured in the USA with imported merino wool. The couple wears them for all their adventures–winter and summer. They even wear their compression socks (no more blood clots!). CloudLine has offered a 25% discount for all friends and family of Justin and Patrice. Just use the coupon code “wanderinglavignes” (see sample).